“By next year we should be in a cash flow positive position,” Thoma said, citing 11 customer commitments and Aireon’s service activation. He declined to state how much revenue Aireon anticipates this year. Aireon in December borrowed $200 million through a Deutsche Bank-led group of investor funds after manufacturing and launch delays with Iridium Next pushed out when Aireon could start service. It used those funds to start paying Iridium overdue fees for hosting its sensor network. SpaceX launched all 75 Iridium Next satellites between January 2017 and January 2019. In early February, Iridium declared the completion of its $3 billion constellation refresh with the activation of the final two spacecraft needed to complete the network of L-band voice-and-data satellites. Aireon has raised $351 million to date, of which $69 million came from NATS and $150 million from NAV Canada. 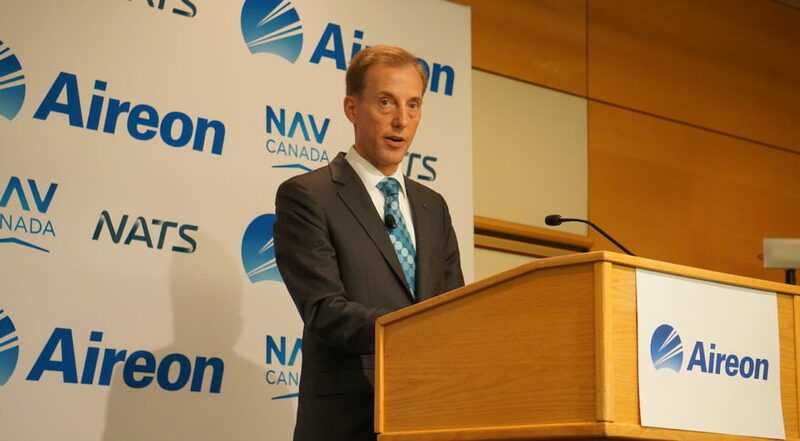 At the April 2 news conference, officials from NATS and NAV Canada said trial service with Aireon is already demonstrating how space-based flight tracking can improve flying. Rolfe said Aireon’s service enables NATS to trial closer flight paths, reducing the separation distance from 40 nautical miles to 14 nautical miles. Rolfe said those changes are estimated to generate $300 in fuel savings and reduce carbon dioxide emissions by two tons per flight. Aireon’s sensors track Automatic Dependent Surveillance Broadcast, or ADS-B, signals from aircraft equipped with such transponders. 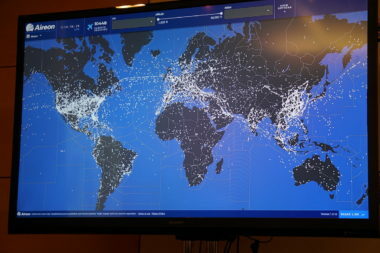 Thoma said most aircraft are already equipped with ADS-B transponders, and that 2020 mandates for ADS-B in the United States, the European Union and elsewhere are driving high adoption. Neil Wilson, president and CEO of NAV Canada, said NAV Canada is testing Aireon flight tracking in Alberta and other areas where it has ground-based radars, and plans further service expansion. Aireon is still working to bring the U.S. Federal Aviation Administration onboard as a customer — a process Iridium anticipated would have happened by 2015 or 2016. Thoma said the FAA has been involved with Aireon since 2011, the year Aireon was founded, and has been “working very closely” with the company running tests. The FAA recently demonstrated heightened interest in Aireon data after Ethiopian Airlines’ deadly March 10 crash of a Boeing 737 Max 8 near Addis Ababa, Ethiopia, killing all 157 people onboard. Thoma said the FAA contacted Aireon for data the same day, and that Aireon provided the requested data to the agency and the National Transportation Safety Board.